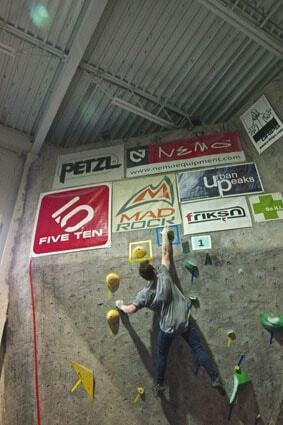 KMS youth climber Sam Hayden practices the skill that garnered him third place in a regional championship. KILLINGTON — On Saturday, Dec. 12, Killington Mountain School Rock Climbing athlete, Sam Hayden from Pittsfied, Vt., competed at the USA Climbing ABS Regional Championships in Newburyport, Mass. The event brings together the best youth climbers in New England and is the qualifier for the Northeast Divisionals. In bouldering, the championship events are an on-sight format. This means that the competitors do not get to review or try the climbs until they come out of isolation. Competitors must climb six climbs. They have 4 minutes for each climb and 4 minutes rest in between each climb. While they rest, they sit in a chair facing away from the wall so that they cannot see any other competitors climbing or gain any knowledge of how to solve the climb. Spectators are not allowed to talk to the competitors while they are climbing or during their rest periods other than to cheer them on. Sam Hayden was in the toughest division of the competition; one of his competitors won the silver medal at Junior Worlds this past summer, and two others have been on the US National Team and were prior national champions. Hayden flashed his first climb (the verb “to flash” means to get to the top on the first attempt.) This gave him extra time to rest before moving onto his second climb, which had a huge dyno (jump) to a horrible sloper (think slippery upside down bowl). After several attempts Sam completed the dyno and almost finished the climb, falling just one hold away from the finish. Climb number three required strong shoulders and dynamic movement to really small holds. On his first attempt, Hayden fell one hold away from the finish. After resting for about 30 seconds, he made a second attempt and almost succeeded, falling from the finishing hold. Participants are required to match both hands on the finish for three seconds to exhibit control. At this point Sam Hayden made a really strategic decision; he chose to rest the remaining 1.5 minutes, giving him extra time to be ready for the next climb instead of making another attempt on the climb he had almost finished. The extra rest paid off, and Hayden flashed climb number four; he was one of only two climbers to flash that climb. He then sent his fifth climb on his second go, becoming one of only two climbers to finish this climb as well. Climb six was brutally hard — nobody in the field finished it. Hayden finished the day in third place, two holds out of second, and besting several climbers whom he has never beaten before. The top ten competitors from each of the northeast regions move on to divisionals which will be in Glastonbury, Conn., Jan. 9-10.